Start by making the lentil mince. Heat the olive oil in a large saucepan over a medium–high heat and cook the onion for 2–3 minutes until softened but not browned. Add the garlic, cinnamon, paprika and oregano, and cook for 1 minute, stirring constantly. Pour in the chopped tomatoes, lentils and yeast extract, and simmer for 10 minutes. In the meantime, prepare the aubergines. Heat a griddle pan until hot. Brush the aubergine slices with the olive oil and place them on the hot pan, cooking them for 2–3 minutes on each side until softened and grill marks appear. Grill the tomatoes for 1 minute, cut-side down. 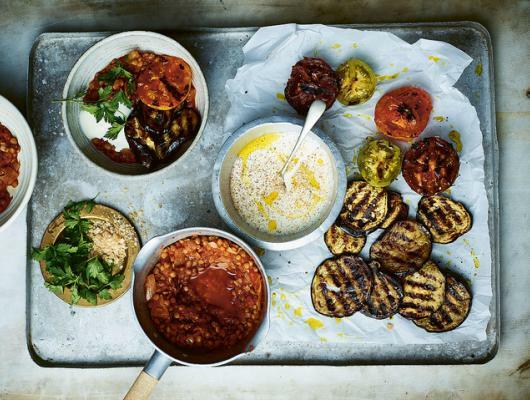 Spoon the lentil mince into bowls along with the aubergine slices and griddled tomato halves. Spoon over the soy yoghurt and sprinkle with the grated nutmeg. Season to taste with sea salt and scatter.